Skidding, sliding, hydroplaning…. Cold and wet weather brings a whole host of scary driving possibilities! In conditions like these, you’ll want your tires to have the best possible grip on the road. In addition to checking your tire pressure, here are five more tips to help you make sure your tires are ready for fall and winter driving! To function safely in the variety of weather conditions your car will encounter, your tire tread must be in good condition. In wet conditions, tread grooves help to channel water out from under your tire and off to the sides, allowing your tire to maintain contact with the road. When these grooves become too shallow, water cannot drain fast enough, and the tire can lose its grip on the road, causing you to hydroplane. Shallow tread can also contribute to skids in dry conditions. In most states, tires are legally considered “worn out” and must be replaced once the tread is worn down to 2/32 of an inch. Depth gauges are available, but you can also use the penny test to check for legal tire tread depth. Place a penny into a tread groove, with Lincoln’s head facing down into the groove. If part of his head is covered by the tread, you’re good to go - but if you can see all of his head, it’s time to replace the tire. Most tires also have built-in treadwear indicators or “wear bars.” When your tires have worn down to 2/32”, the indicators will look like narrow strips of smooth rubber across the tread. If you can see these, your tires are worn out and need to be replaced. Recent performance tests of stopping distances and road grip conducted by Tire Rack, an independent tire testing group, revealed that the legal minimum requirement is significantly less safe than just 2/32” more tread depth. As this video shows, the test vehicle equipped with tires at 2/32” tread depth was still traveling at 44 MPH at the point where the vehicle with 4/32” tread depth had come to a complete stop. As a result, the American Automobile Association now recommends using a quarter instead of a penny to check that your tread is at least 4/32 of an inch, the distance from the edge of the quarter to the top of Washington’s head. Also keep in mind that drivers expecting to encounter snowy conditions will need more tread depth to “bite” into snow-covered roads. Tire Rack recommends replacing tires when they reach 6/32” if you are anticipating snowy weather. Check your tread depth at the outer edge of the tire, the center, and the inside edge. If the measurements aren’t the same, your tires are wearing unevenly. Uneven tire wear can indicate that tires are over or under inflated, that the wheels are out of alignment, or that suspension components are worn. AAA provides a guide to Tires and Wheels with more information. Like any rubber, tires break down over time. As they age, tires lose integrity and become more prone to failure. According to the NHTSA, tire aging is a factor in 90 traffic deaths and 3,200 injuries per year. 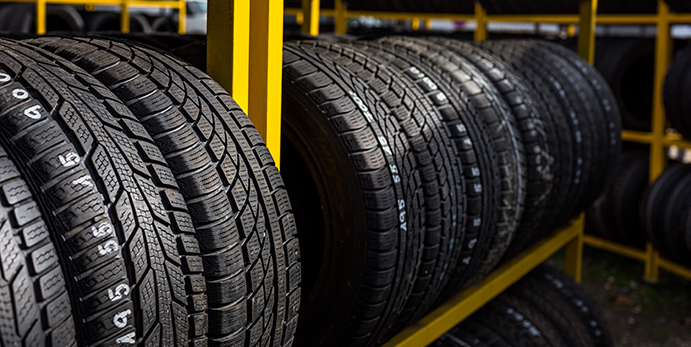 Some tire companies recommend replacing tires after 6 to 10 years, but exposure to the elements and how well you take care of your tires will determine how long your tires are safe to drive on. You can look at the information printed on the tire sidewall to find out their age. The last two digits of the seven-digit Tire Identification Number will tell you the year it was manufactured. Make sure to also check tires on cars that aren’t driven very often, and don’t neglect your spare tire! Tires age whether or not they are driven on regularly, so in these situations the rubber in your tires could deteriorate to an unsafe level even before your tire tread wears down. You can ask your automotive repair professional to examine the tires at your next service. If you’re heading to a snowy area, make sure you have tire chains stored in your trunk! Not only are they an important safety measure, but they’re actually required by many state departments of transportation in snowy conditions. If you decide to skip them, you’re taking the risk of having to buy chains at steep prices when you reach the point where they’re required, if they’re even available, or turn around and head home. To purchase snow chains, you’ll need to know the size of your tires, which can be found on the Tire Identification Number. Your owner’s manual will also tell you whether your car can be equipped with chains, and what type are recommended. It’s also a good idea to familiarize yourself with installing and removing the chains before you’re forced to do so in poor weather conditions! Uneven tire wear, unusual vibrations or noises, or a pull to one side as you drive can indicate problems that require special skills and tools to fix. Most drivers will want to leave these tasks to professionals, but understanding the basics will help you make sense of what your mechanic tells you! Refer to your owner’s manual for your vehicle’s recommended maintenance schedule, but if you notice a problem, it’s best to get it fixed as soon as you can. Tires on the front and rear of your vehicle perform different steering and braking functions, causing the tires to wear differently. Rotating your tires, or moving them to different wheels, helps to even out tire wear. Wheels and tires often aren’t precisely round, so mechanics balance tires by adding small weights to even out the weight distribution of the wheel and tire around the axle. Normal wear and tear or an impact with a pothole or curb can cause your vehicle to get “out of alignment.” You might notice uneven wear patterns on your tires, or notice the car pulling to one side. When correcting the wheel alignment, mechanics adjust a variety of suspension components to meet the car manufacturer’s specifications. Looking for more information about tire safety? Check out Tire Rack’s Tire Tech and Winter Tire Tech articles!